I like the introduction, notes, vivid details of life in Tuscany and funny stories in the book that I really enjoyed. The dishes are simple, traditional and have robust ingredients. 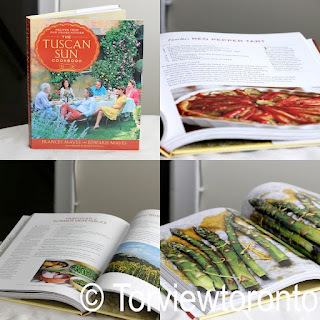 There are detailed recipes in the book, which shows us how to make favourite dishes such as lasagna, pasta with and without eggs, sauces, gnocchi and many more from scratch. 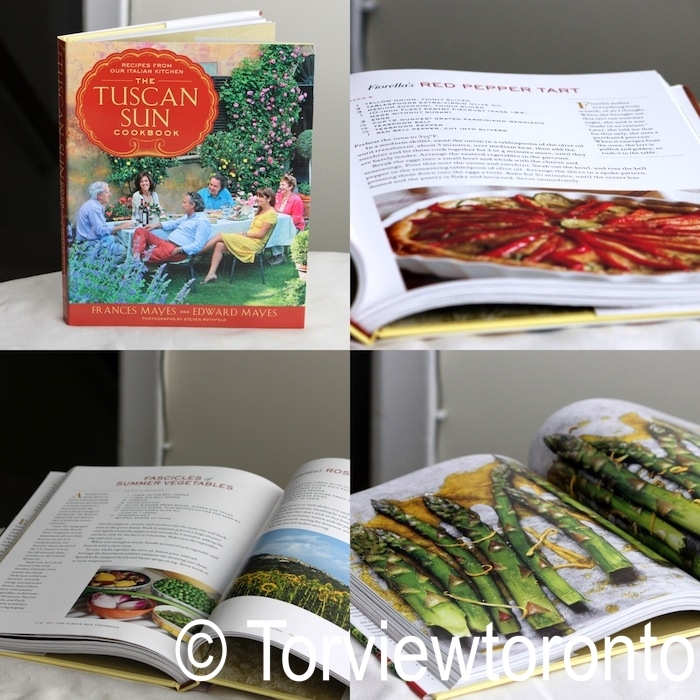 The author says, "Tuscan food tastes like itself. Ingredients are left to shine, not combined with a list of long... odd combinations." Recipes call for a few ingredients so the pantry of a Tuscan kitchen is important. The book is organized like a traditional Italian dinner, and starts from a list of Antipasti (starter) and ends with Dolci (desserts). To dry herbs, the author suggests that we have remove the herbs with the stems, spread on a rack and rest it in a warm dry place for about four days and then strip the leaves and store in a jar. In an oven proof skillet, over medium heat add oil and sauté the onion until translucent about 2 minutes. In a bowl beat the milk into the eggs. Stir the pasta, seasonings and cheese into the eggs and pour into the pan. Arrange the tomato slices on top of the egg mixture and cook for about 8 minutes over medium low heat until it is semi-set. Sprinkle the parsley and put under a preheated broiler for 1 minute. Make sure it doesn't burn on the top. The frittata sounds delicious and has a beautiful color! Yummy and wonderful pasta frittata. Made perfectly dear. Yummy choice with the left over pasta. Makes for a filling & tasty breakfast!! looks like I'm gonna love that cookbook!! That is so vibrant and gorgeous....absolute comfort food!! Sound good, looks good, I bet it tastes good, yum all that carb! Heavenly! Hi Akheela, your fritata look simple yet so delicious. Thanks for sharing the recipe. That's a delicious frittata, looks fantastic! That dish looks delicious - love the bright colours too! That looks so delicious! I can never get my frittata to turn out so nicely! Wow! very yummy looking frittata. Oh, I just realised I have been looking at the wrong blog all this time. Sorry. Like this frittata with pasta. A totally complete meal in itself.